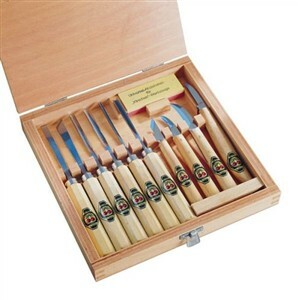 The 11 Piece Carving Set from Two Cherries includes tools for both relief and chip carving. A good choice for beginners and for expert carvers who need to replace tools or expand collections, the Two Cherries set features forged blades of high carbon tool steel hardened to Rockwell 61 for long-lasting sharp edges. Ferruled handles in the traditional hexagonal pattern hold up well to mallet work and provide plenty of leverage for hand control. The facets of the handles also keep the tools from rolling off the workbench. The standard selection of skew chisel, flat chisel, V-chisel, and three sizes of gouges gives carvers plenty of options for creativity. Four chip carving knives in this set let artisans expand into that old European folk art as well. Carvers use the chip carving blades handy for all sorts of finishing and trimming work. Joiners and carpenters find the straight point of simple knives like these much more accurate than a pen for laying out mortises and tenons. They're likely to be some of your favorite tools. The tools in the set are easily honed with the small stone included in the assortment. Use one side exclusively for the straight edged tools and save the other for the bevels of the gouges. De-burring the chisels requires only a leather strop, but that final step for the gouges will be better handled by a matching honing slip. Storage is provided for both the tools and the sharpening stone in the form of a nicely built hardwood box with tenoned corners and strong metal fittings. You may be tempted to use the lid as a first project.